Much like Odisha's Sundargarh district, Simdega is often referred to as the cradle of hockey talent in the Jharkhand state, which has produced players of repute for a great many years. Former India midfielder Bimal Lakra, and siblings Birendra and Asunta, too hail from this land where hockey has developed into a way of life. Rewarded with an AstroTurf stadium to help fulfill the ambitions of young hockey aspirants who seem to be gifted with an abundance of skills, Simdega continues to fuel the rise of a never-ending stream of youngsters who possess a fierce determination to make it to the highest level. 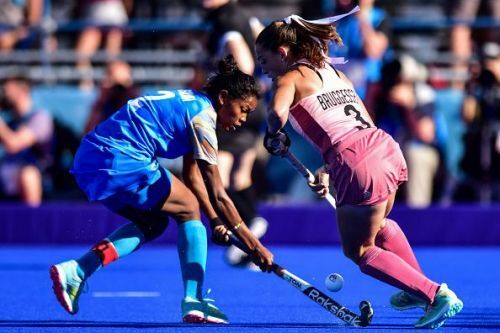 Simdega's more recent gift to Indian hockey is Salima Tete - a youngster whose maturity defies her age by some measure, as Sportskeeda found out during an exclusive interaction following her successful transition to the senior squad. Not many teenagers can claim to have captained a national side all the way to the podium at a Youth Olympic event - but when asked to dwell on the historic moment, the young defender's response leaves one a bit dumbfounded. "We could have beaten Argentina in the final - but I feel the girls fell just a little short when it came to keeping up the momentum. We were almost there and should have won gold." The girl from Jharkhand was barely sixteen when she established her credentials in a big way as vice-captain of the team which won bronze in the U-18 Asia Cup of 2016. The Spain tour, earlier this year, was Salima's second stint with the seniors - the first having been in 2016 when she accompanied the Indian eves to Belgium when Neil Hawgood was the coach. Sjoerd Marijne who is in charge of the team currently reckons that the youngster has what it takes to cement her place in the senior squad but needs to back herself and perform consistently. "Salima just undertook her second tour with the national team. Her strengths are her speed and her push pass from running." Seasoned defenders Sunita Lakra and Deep Grace Ekka have, for long, been the bedrock of the Indian defence and the duo from Sundargarh have spared no effort in taking young Salima under their wing. "Sunita and Deep Grace have given me a lot of support. All the senior defenders spend time advising me on the dos and don'ts during practice sessions. I also enjoyed the experience of playing alongside such experienced campaigners." The Indian girls who had lost to China in the finals of the Asian Youth Olympic Qualifiers, last April, turned the tables on the defending champions in the Buenos Aires semifinal, much to the delight of their supporters. "We were determined to beat China in the YOG semifinal and the entire team was totally focussed on the task - it felt great to beat the Chinese and progress to the final," says Salima whose parents advised her to work harder to help the team win gold the next time over, following their loss to the hosts in the summit clash. Salima and co. had taken a quick lead as early as the first minute but the Argentinian girls scored three in a row to dash Indian hopes. "My family was of the opinion that we could have won gold - they want me to work harder and win the title in future tournaments." Not surprising, as her father himself was a hockey player and her family too have imbibed in her an urge to go the extra mile. Great journeys often require the assistance of dedicated companions - and Salima has shared many a magic moment on the pitch with another promising and upcoming talent from the North-East. "Siami's Hindi has improved a lot"
Young Lalremsiami played a key role for the Indians in the Youth Olympics, and the Mizo sensation - much like Salima - is part of the senior squad as well. The two phenomenally talented teenagers have been playing together from as far back as the U-18 Asia Cup of 2016, and share quite a bond. While Siami (as she is fondly called by her teammates) is a livewire upfront, Salima is solid in defense, but in the compact and superfast Hockey 5's format, their roles often merge. Lalremsiami, who had to strive hard to communicate with her teammates in the early days has now overcome the language barrier and is doing fine, as Salima revealed. "Siami's Hindi has improved a lot and we can now communicate without any hassles whatsoever - we have a great understanding with each other." "This is the reason we manage to create lots of chances, many of which end up in the back of the net." The version of hockey which was on display at the Youth Olympics and the Youth Olympic Qualifiers is fast and exciting, but there is not much room for error, as the junior Indian captain explained. "Hockey 5's is extremely fast, and we need to be on our toes every second as the slightest mistake can result in a goal for the opposition." Yet, for all Salima's prowess in the shorter version of the game, her re-entry into the senior squad will now require her to perform with a greater level of determination and consistency, as coach Marijne points out. "Salima has the potential to be a national player on a continuous basis but the road is long and she has to maintain her form and believe in herself." Indeed, the road is long, and the possibilities are just as immense, as the Indian women's team endeavors to add depth to what is undoubtedly a formidable unit. "I would like to play well for the team," says Salima when asked what her long-term aims are. "One day, I hope to captain the seniors as well." The response typifies the steely resolve of a young achiever with dreams in her eyes - and the courage to pursue them no matter what.